Eyewitness accounts of a fire which killed 13 young party-goers in south-east London have been heard by a jury at a new inquest into the deaths. 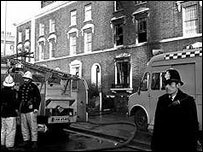 Statements from the time of the fire in Deptford in 1981 were read out at Inner London Crown Court on Wednesday. Neighbour Norman Lewis heard screaming and added: "I saw someone jump through the glass and he was ablaze." Others described the sound of popping glass as the house was engulfed in flames. The victims, aged 14 to 22, were celebrating at a birthday party when the fire started. The inquest has heard that 13 people died in the fire and another victim, Anthony Berbeck, died later "following trauma brought on by the fire". Retired paramedics and a hospital porter told the inquest on Wednesday how they treated the victims. John Pomeroy was in one of the ambulances which attended the scene. He said he found an injured man who had suffered wounds to his back after jumping through a window. Alfred Watling, a porter at the Greenwich District Hospital, said he cut the clothes off one of the injured boys from the fire. He told the inquest the boy's jeans smelled of paraffin. Inner London Crown Court will hear from more than 100 witnesses. Police reopened the investigation in 1997 after lobbying by relatives and local MP Joan Ruddock. But attempts to get a new inquest were twice rejected, until the High Court finally agreed to demands in 2002.